Courier and postal experts DX, were implementing a LEAN Management process. How to get everyone on-board without making them feel threatened? To inform directors and staff that LEAN doesn’t mean MEAN, and that everyone’s input is needed. Staff at all levels in the organisation in nationwide offices. Not always aware of changes and what is happening at head office. They sometimes feel nobody asks them for their opinion. Could see LEAN as a way of cutting jobs. The management need my thoughts and opinions on where we can make the company more efficient. I have ideas which I’d like to put forward. This will secure the company’s – and therefore my own – future. 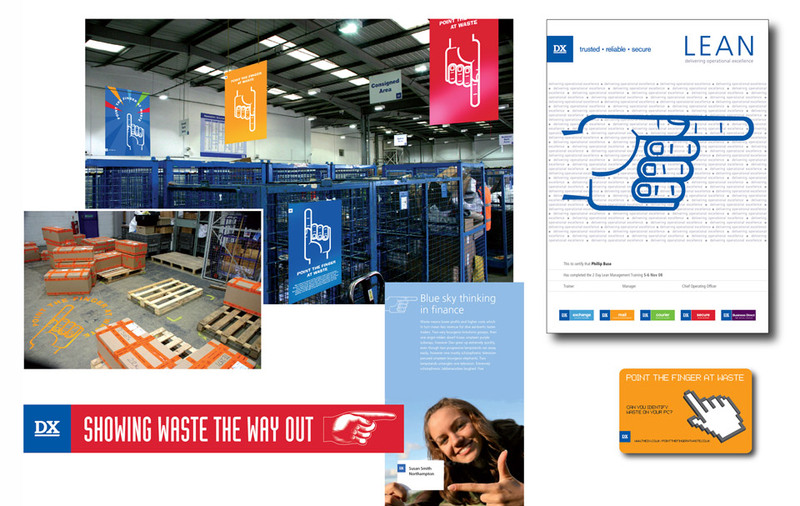 Quirky and surprising imagery featuring ‘pointing the finger at waste’ helped convey that everyone’s input was needed from all departments in the company.